Daredevil, the blind avenger of Hells Kitchen faces a life changing decision when he is presented with the chance to see again. But at what cost will Matt regain his sight? Guest-starring Bullseye! The Kingpin of crime, ever the Machiavellian mastermind, uses lawyer Matt Murdocks quest for justice against him in a deadly money-making scheme. 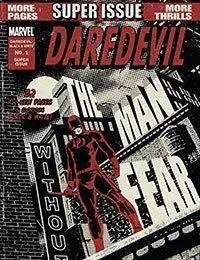 And the Man Without Fear finds himself embroiled in a gang war in Japan. All this and much more in this all-black-and-white one-shot in the spirit of the Mighty Marvel Magazines of yore, but All-Now in style!